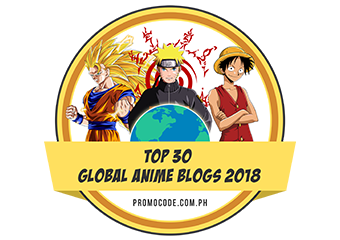 The year is almost over and with just few more days left, it's about time to prepare our year-end list. 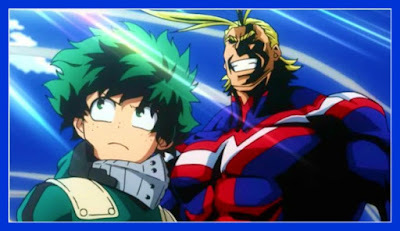 First in our agenda is featuring the best anime opening of 2018 that made our anime-watching habit lit, and even more exciting and enthralling. 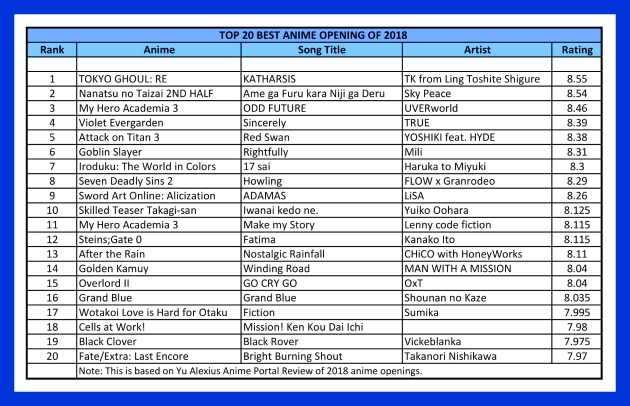 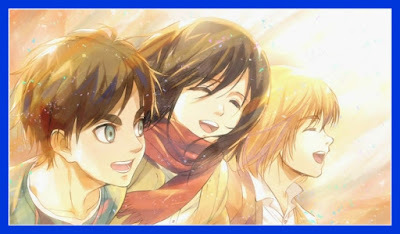 We had looked back at some of the best anime opening theme song in every seasonal chart of 2018 and the following entries were the 20 best anime opening of 2018 as per standard of our team at Yu Alexius Anime Portal. 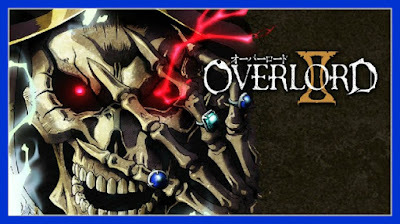 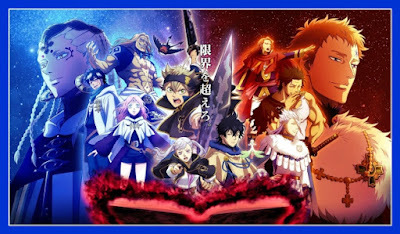 Official Video: Fate/Extra: Last Encore "Bright Burning Shout"
Official Video: Black Clover "Black Rover"
Official Video: Cells at Work! "Mission! 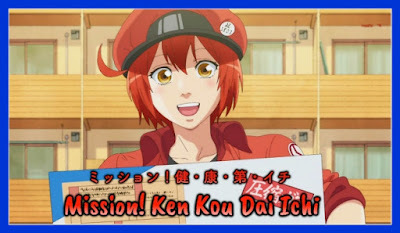 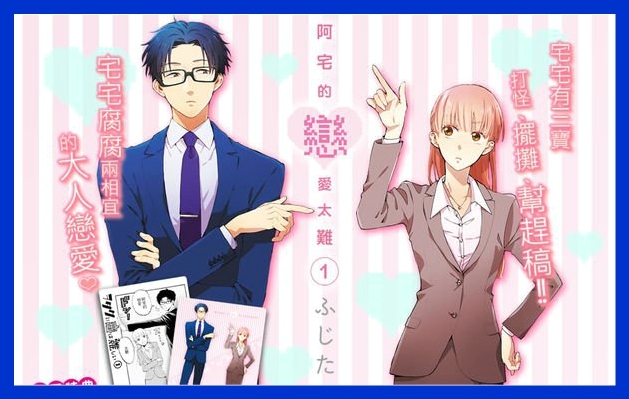 Ken Kou Dai Ichi"
Official Video: Wotakoi: Love is Hard for Otaku "Fiction"
Official Video: Overlord II "GO CRY GO"
Official Video: Golden Kamuy "Winding Road"
Official Video: After the Rain "Nostalgic Rainfall"
Official Video: Steins;Gate 0 "Fatima"
Official Video: My Hero Academia 3 "Make my Story"
Song Title: Iwanai kedo ne. 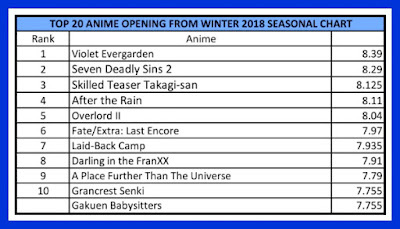 For the scoreboard of our Top 20 Anime Opening list of 2018, please see the image below. 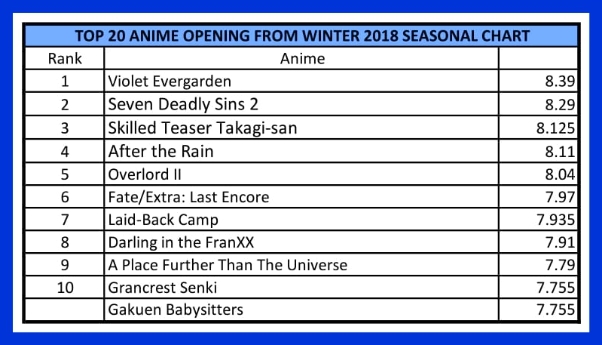 Meanwhile, we also listed the Top 10 anime openings from the 4 seasonal charts of 2018: Winter, Spring, Summer, and Fall. 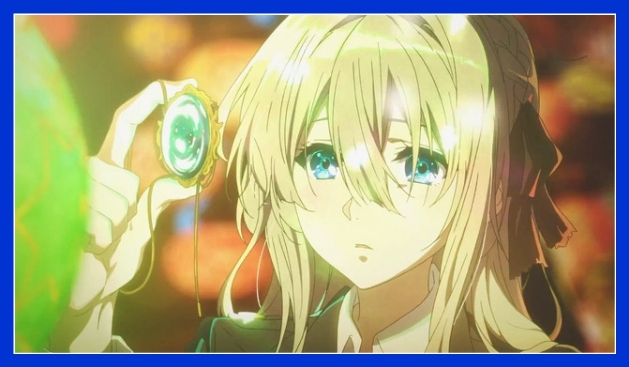 The anime opening from Winter 2018 seasonal chart were led by the beautifully and astoundingly amazing Violet Evergarden which brought to us a magical experience. 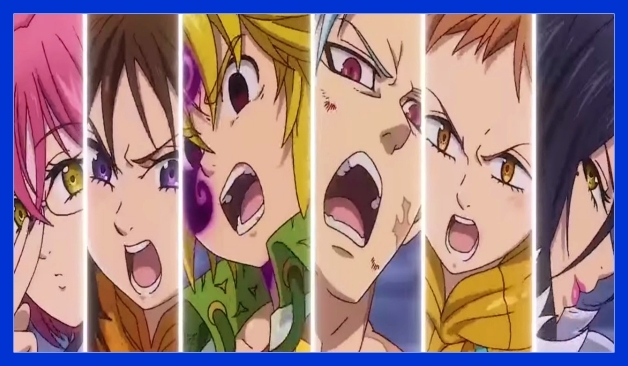 Coming on second place is the first opening theme of Seven Deadly Sins season 2 which is a great collaboration between Flow and Granrodeo - two of the most popular bands that provide us some of the biggest anime openings of the decade. 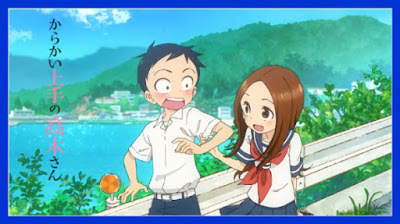 The cutesy ambiance of Skilled Teaser Takagi-san, After the Rain, Laid-Back Camp, and A Place Further than the Universe also made it in our top 10 list. The Seven Deadly Sins made a great comeback with Ame ga Furu kara Niji ga Deru from Sky Peace as it hit the skyrocketed 1st place against another great entry this year which is ODD FUTURE from UVERworld of My Hero Academia season 3. 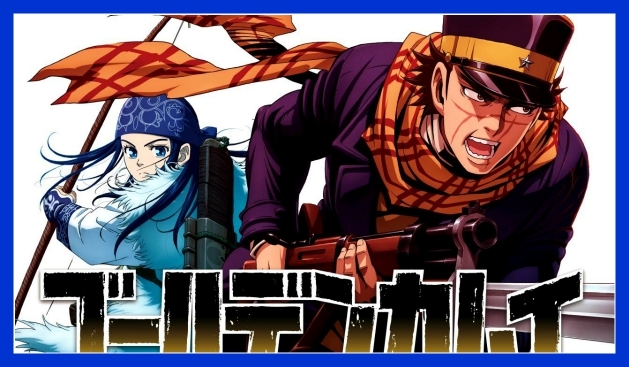 Surprisingly, Golden Kamuy reached the 3rd place with its catchy opening from MAN WITH A MISSION. 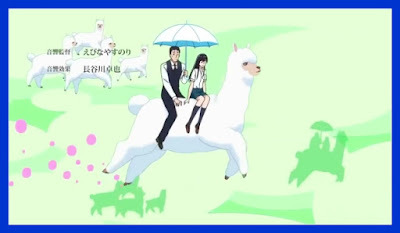 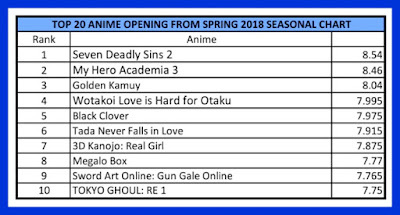 The rest of the entries from Spring 2018 anime lineup were pretty good especially Black Clover's Black Rover - the anime's 3rd anime opening theme and the adorable Tada Never Falls in Love. 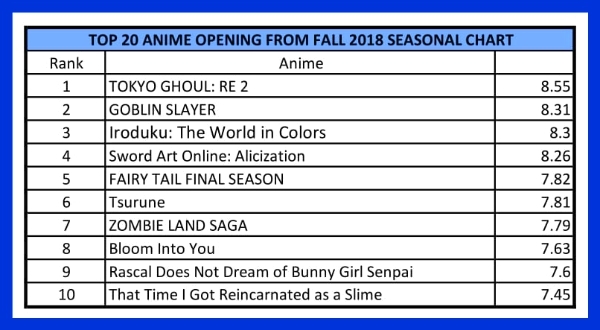 Tokyo Ghoul:re's ASPHYXIA were also able to secure the 10th place. 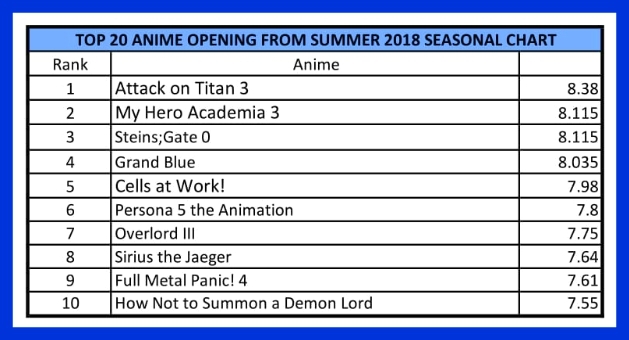 Another anime with the most epic OST also returned this 2018 and it's no other than Attack on Titan which brought us Guren no Yumiya and Shinzou Sasageyo. 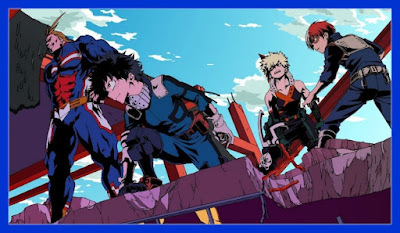 My Hero Academia 3 also continue its streak on the 2nd place with a new song titled Make my Story and I seriously believed that it is adorable beyond reason. 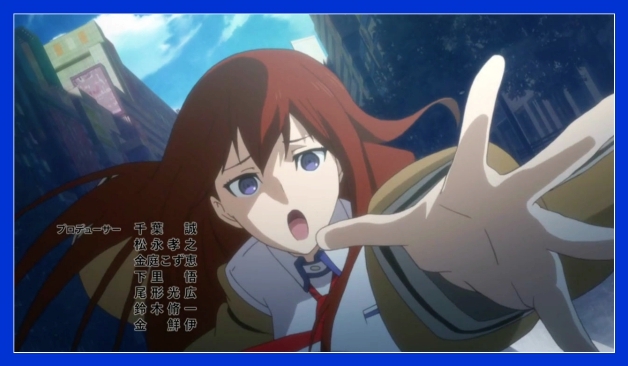 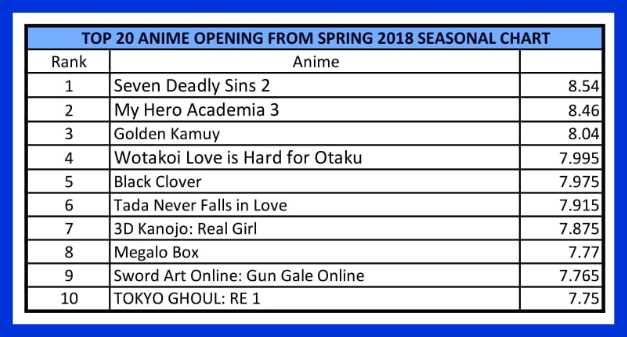 Followed by a legendary anime title from Steins;Gate franchise while the obnoxiously fun Grand Blue got the 4th place. 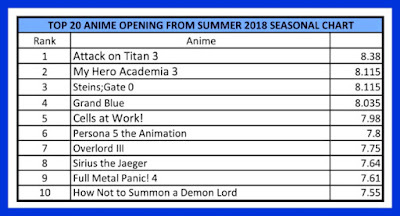 Overall, Summer 2018 anime seasonal chart we're filled with anime openings for action-packed series. 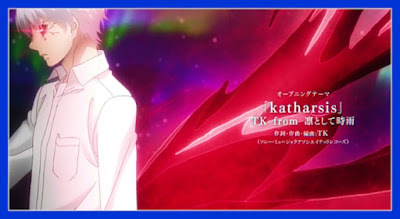 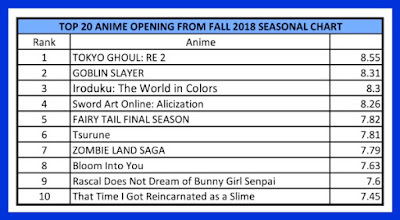 In Fall 2018 seasonal chart, the anime opening list is dominated by Tokyo Ghoul:re's Katharsis by a large margin. Well, it's undeniably addicted afterall coming from TK who also gave us the legendary Unravel 4 years ago. 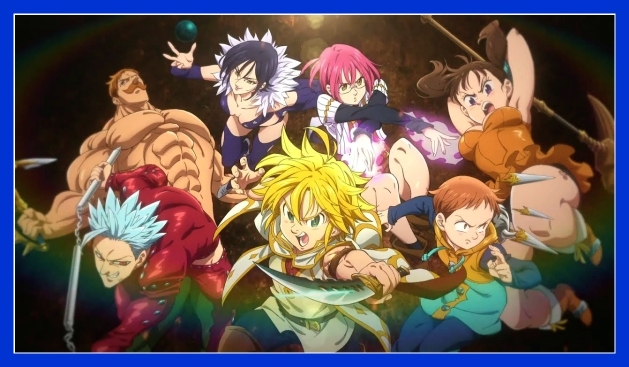 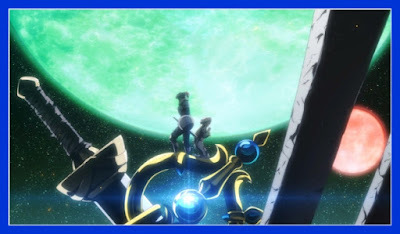 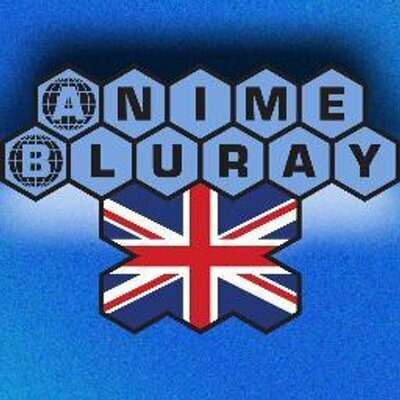 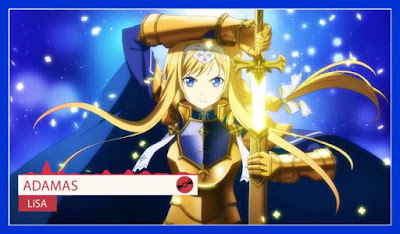 Joining its league are several giant anime titles which opening theme this season we're pretty good such as Sword Art Online III and Fairy Tail Season 9 (Final Season). The romance anime also gave us a delightful surprise with Bloom Into You, Rascal Does Not Dream of Bunny Girl Senpai - both anime having a very cute opening theme. 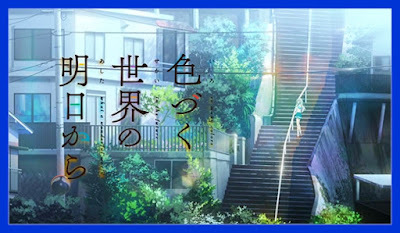 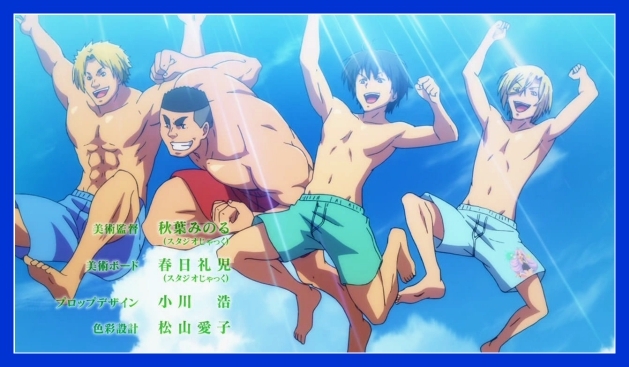 For refresher, you may also check which anime that aired last year was included in our Top 20 Anime Opening of 2017. That ends our list of the best anime openings of 2018. Please let us know which one is your favorite or do you have any other entries that you would like to recommend. 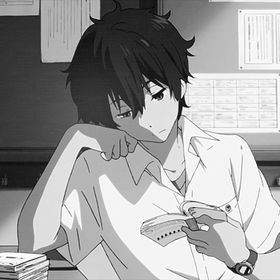 Don't forget to leave us a comment for your thoughts.